My big knock on many sci-fi builders is that they rarely build a setting for their awesomesauce pointy-nose spaceships, opting instead for the typical TBB friendly eye-burning white background. Raoul Baldwin (Raoulosos) clearly knows the power of a well constructed diorama to not only complement but elevate a futuristic personal conveyance. 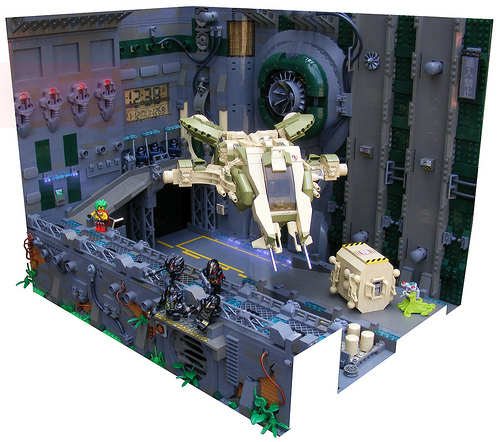 This immersive scene has all the sci-fi boilerplate a viewer could ask for: elevated walkways, floating ship, textured walls and wacky minifigs. Raoul also shows that he understands how to use color, using tan and olive for the ship and its container and nowhere else. My only nitpick is that if the builder had zoomed in just a little more, he could have eliminated the white border entirely. Many builders won’t go this extra step because it means that part of the build will inevitably be cut off. Enjoy your Saturday serving of sci-fi action.